"The 70th anniversary of NATO's foundation is a black anniversary for the people in all over the world, but also an opportunity to look back at the bloodstained history of the imperialist organization which continues in our times. 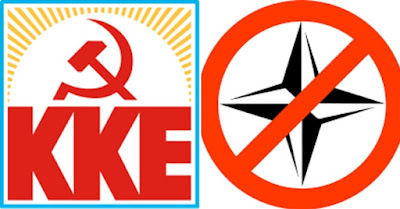 NATO was founded on April 4, 1949 in order to become the armed arm of the euroatlantic imperialism against the socialist camp and the then rising struggle of the people around the world, the communist movement. After the dissolution of the USSR and the overthrow of socialism, NATO not only did not dissolve but continued more aggressively, exploiting the elimination of the "rival camp" and the retret of the international workers' movement. The dozens of wars and imperialist interventions, the border changes and the dissolution of states, the carnages of victims and the millions of refugees, especially in our neighborhood, consist a proof of the truth. The 70th anniversary of NATO's founding consists an opportunity for the people to consider the suffering he has experienced and continues living because of the country's participation in this organisation. It is an opportunity for the young people to learn about the bloodstained history of NATO. So that the struggle against NATO and the EU, against the foreign bases and our country's participation in the dangerous plans will be strengthened. In order to strengthen the common struggle of the people, the only hopeful prospect which is the disengagement from these imperialist organisations and the clash with capitalist barbarity".